I bought these for my son’s 27th birthday and he loved them. He wore them and never lost them while traveling for a year, he still wears them. They have no scratches and look brand new. The case is perfect in protecting the glasses and came in the beautiful box. I always wanted a pair for myself because they are so portable, and the lenses are polarized. You'll love the iconic look of these Ray-Ban sunglasses. The Wayfarer style features a bold and defined black frame, and this pair sports high-quality green polarized lenses for optimal vision and cool style. Designed to be both practical and fashionable, these glasses are the perfect accessory. They fit comfortably on your face and protect your eyes from 100 perfect of harmful UV rays, allowing you to enjoy sunny days without worry. The glasses come inside a stylish leather case for convenient storage and transport. Ray-Ban has really gone above and beyond and taken the legendary Wayfarers to the next level in making them even more compact by massif the bridge and temples foldable. They end up being 1/3 of the old size and great for today's smaller purses. I love this new feature while still enjoying Ray-Bans tried and true quality! Great quality, at a great price. Authentic, polarized Ray-Bans with a great protective case. I get so many comments and compliments on these glasses. Who knew folding glasses were such a novelty. Once unfolded the glasses are virtually indistinguishable from regular wayfarers. They are comfortable and I love the polarized lenses. The only downside, and it’s not enough to take off a star, is that the lenses tend to get streaky quickly and I find myself cleaning these glasses much more often than any other polarized pair I’ve owned. I took these on a 2-week trip to Ecuador, and they were exactly what I wanted!! Their small, foldable size meant more room in my bag for other items. Once you have them on, you can’t tell they’re foldables. Other people on our vacation were very jealous and plan to buy their own pair. And of course, Ray-Ban sunglasses are excellent quality. A bonus: even though they’re dark and polarized, my iPhoneX’s facial recognition still works when I’m wearing them. The Ray-Ban aviators block the facial recognition feature. This was a gift for my sister. She lives in sunny SoCal and as I understand she really enjoys them because she wears them every day. They also look great on pictures if that matters to anyone. But really the polarization is good. For Ray Bans they are great. Of course for better sun protection I would recommend Maui Jims but these are great nonetheless. And they are foldable. Classic ray bans that fold up and fit in your pocket! I love these. Fast shipping and awesome price. Great looking pair of sunglasses, it actually is my favorite pair of Ray Ban, and very convenient since they fold up. Can’t go wrong with a classic fashionable look. Purchased these for son-in-law who travels constantly as a holiday gift. GREAT price and true genuine Ray Ban quality for polarized G15 Wayfarer - amazing leather case slips right into a pocket and lowest price anywhere! Thanks Overstock- he LOVES them! 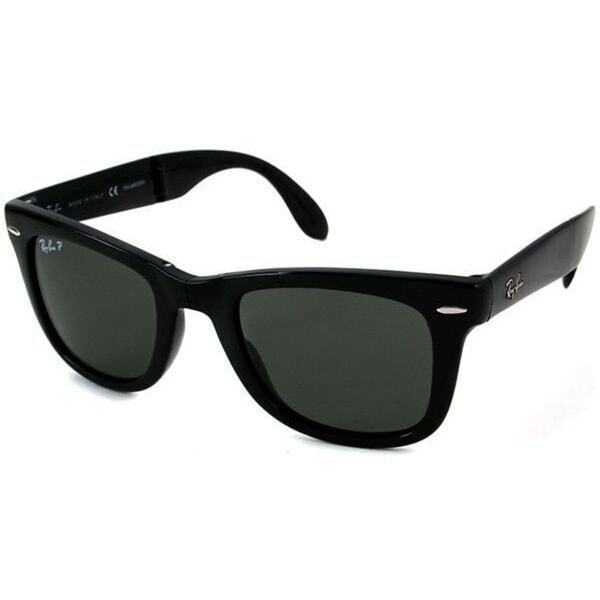 Theese foldable wayfarer glasses by Ray Ban are great. They are very versatile and easy to wear and carry and at the same time very fashionable. I'm very satisfied with my purchase and love the small case they come with. Very easy on the nose and of course iconic. highly recommend! i’ve bought these sunglasses many times over the years from all different vendors-and these were perfect. These sunglasses are the best! You can carry them in your pocket and they stay on your head well. I have had several other pairs of wayfarers and the folding ones are simply the best. The polarized factor is awesome too and the price on overstock was awesome. I would recommend these for anyone who is looking for a nice folding and comfortable pair of sunglasses. Such a great deal - authentic, fit great, classic! Would buy again and again. Talk about the best sunglasses ever!!!! Very compact and fit everywhere. Specially when you have kids you need these things to go on and off quickly. Best chased and best price. These glasses are pretty rad. Nice to be able to fold them up and throw in jacket pocket. They really are not that much more compact than the regular non folding wayfarers so hard to justify the extra money. "Is the lens glass or plastic?" "i recently purchased these glasses but they were stolen from my vehicle, when i received them they were in a small square pouch, Will they still be shipped with aforementioned small square pouch?" Yes - they come in a compact square faux leatherette case that you can carry in pocket or purse. "Are these authentic polarized lenses?" These Ray-Ban sunglasses are genuine and feature polarized lenses. "Does this come with the case shown on the picture or the smaller square one?" Hello debbie, these comes with the case show in the picture. Please let us know if you have any further questions. "The picture here appears to show glossy frames. I am looking for the matte black frames. Are these matte black or glossy black frames?" Hello bmcd4, the picture is pretty accurate. Thank you for shopping with us. "Do you have these in the size 54?" Hello hoyagirl, no, we do not currently have these in a size 54. Thanks for shopping with us! I chose this product because my son will look AWESOME in them, and polarized lenses are good for his sensitive blue eyes. Gift for my boyfriend who loves sunglasses.